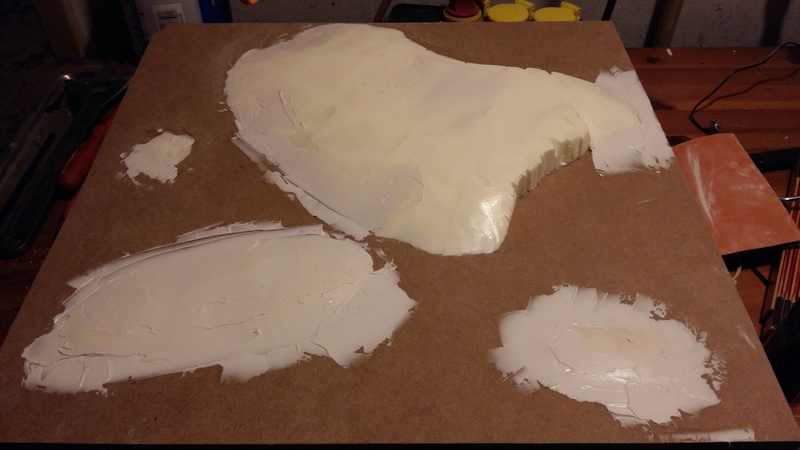 As I wrote in my last blog post I have started to make some terrain for miniature wargames. Model landscapes have always fascinated me and hopefully I can expand into this area with my company in the future, but to do that I need practice. So the first task is to build a wargaming table that consists of four tiles that measures 45×45 cm, so the total playing area will be 90×90 cm. 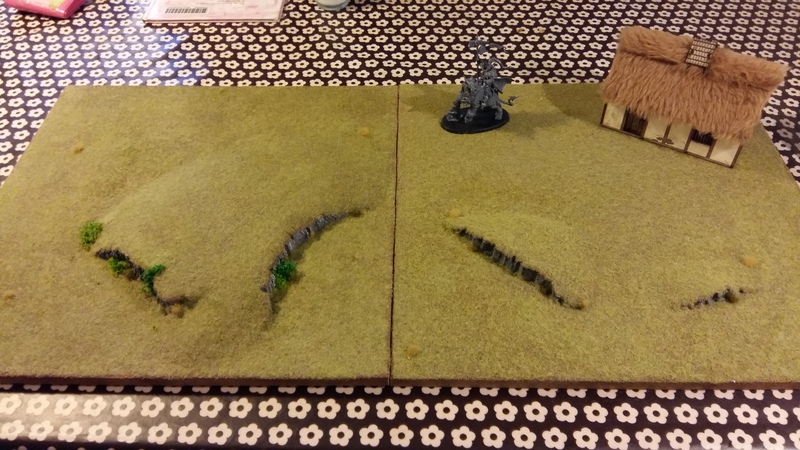 Hopefully a perfect size for some skirmish games, if not I can easily expand the table with some more tiles. After having watched a ton of youtube films on how to build wargaming terrain, this is how I’m doing it. Hopefully it can inspire someone out there. First of all you have to make sure that you have all the material you need to make the terrain. 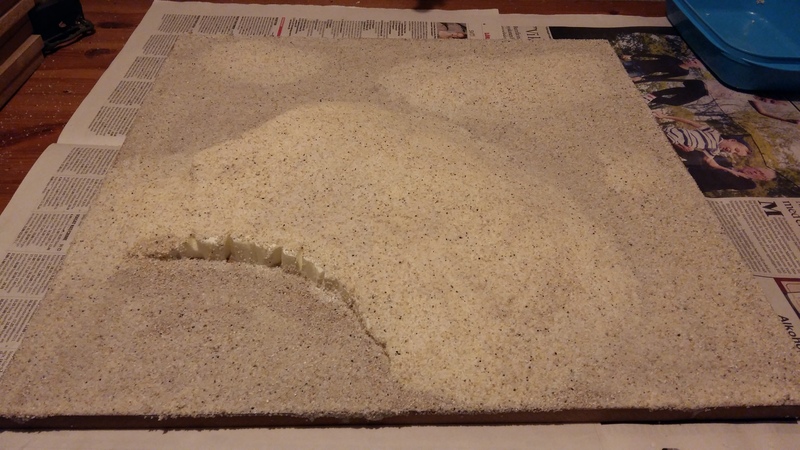 I’ve acquired the following, 45×45 cm MDF board tiles, glue, sand, filler, Styrofoam, static grass, paint and more glue. You cannot have too much glue while doing this, trust me on this one. When you are sure you have all your materials it is time to do some planning. I decided to plan on how to make all four tiles from the start, so I know that I will have something that will be interesting to play on when I’m done. As the first tile to make I decided on a simple hill with some small cliff edges. First I started with cutting out the hill from the Styrofoam and then gluing it to the MDF tile. I also added some very small hills so that the terrain wouldn’t be completely flat apart from the larger hill on the tile. This would make the terrain look more believable. The drawback to this, that I realized when I was done with the tile, is that it is hard to add terrains like houses or forests to the tile when you use it for a game. So I don’t recommend adding those small hills due to that the flexibility of the tile wont be maximized. Secondly I sanded all the hills and also used filler to even out some uneven areas. Adding the filler is a step that I on later tiles successfully eliminated from my work process by making sure that the Styrofoam hills were more even from the start. But if you need to even things out it is easily done with some filler. 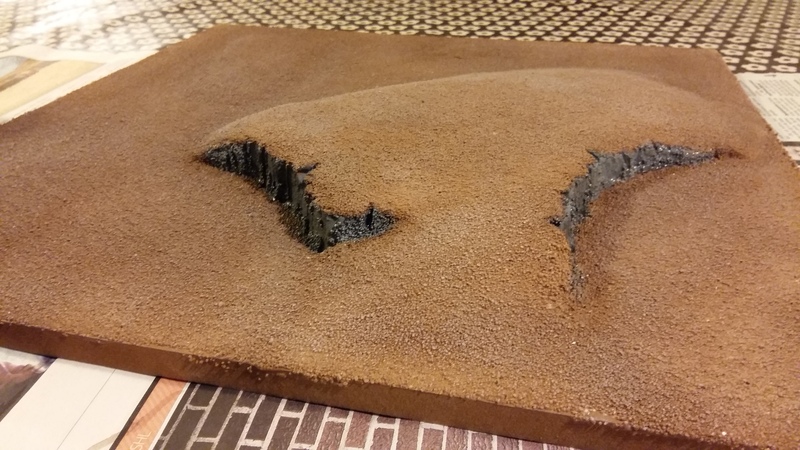 Next step, when you are satisfied with the terrain you have on the tile is to cover all areas, except cliff sides in glue and then pour sand on top of everything. Wait for maybe ten minutes and then turn the tile on its side to get rid of all the excess sand that hasn’t got stuck in the glue. When the tile has dried I sprayed the whole tile with brown paint. When the paint was dry I highlighted all the sand with some white paint and also painted all cliffs grey. When the cliffs where dry I painted them with some dark tone wash from Army painter. I let that dry for a day and then highlighted all the cliffs. This gives the cliffs a very nice colour with a lot of details to it. The last step is to add static grass. To do this I again covered the tile in glue. Make sure that you get quite a thick layer. Then I mixed two colours of static grass, light green and summer green, and poured it all over the tile. Make sure to do this on top of a newspaper so that you easily can reuse the excess that you get. 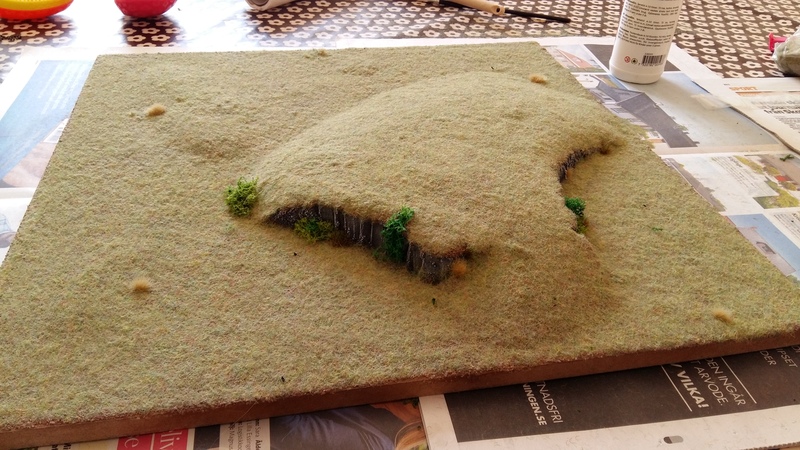 At this stage I also added some static grass tuffs and bushes from Island moss. When everything had dried (I waited for 24 hours) I fixed the static grass by spraying the tile with a 50/50 mixture of water and PVA. Well that’s about it. You will now have a nice looking tile with a grassy hill. So when you are dome with the first you can just start with the next one. And remember you are always one tile short from being finished.